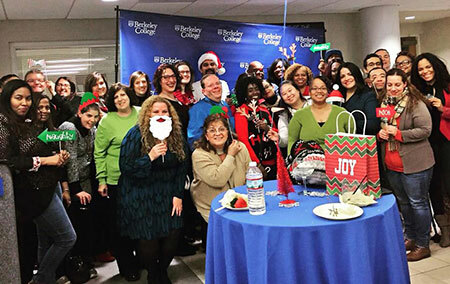 Photo Caption: Berkeley College alumni continue to give back to their communities during the holiday season. Alumni collected more than 50 toys at a holiday reception held at Berkeley College in Woodland Park, NJ, on December 13, 2017. The toys will be donated to the Children’s Hospital at Saint Peter’s University Hospital in New Brunswick, NJ, for children in need, just in time for the holidays. 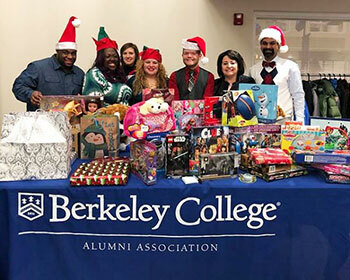 The toy drive was organized by the Berkeley College Alumni Leadership Council and the Office of Alumni Relations and Career Services, whose mission is to engage and connect a network of more than 50,000 alumni worldwide. Click here to read more about services offered to Berkeley College alumni. Pictured above with the donated toys, from left to right, are Edison Jaquez of Perth Amboy, NJ, the 2016 Berkeley College Alumnus of the Year; La-Toya Gomez, Career Counselor, Career Services, Berkeley College; Montina Hardesty of Paterson, NJ, Treasurer of the Alumni Leadership Council; Adriana Delgado of Lake Hiawatha, NJ, Secretary of the Alumni Leadership Council; Michael Iris, Assistant Vice President, Alumni Relations and Career Services, Berkeley College; Ana Yee, Director, Alumni Career Services, Berkeley College; and Arjune M. Sharma, Director, Center for Academic Success, Berkeley College, and President of the Alumni Leadership Council. Pictured below, Berkeley College alumni and officials gather to celebrate the holidays and collect toy donations for children in need.